One day, she called his parents and asked them to come to St. Teresa's for a consultation. As the Forresters sat quietly in the empty classroom, Doris said to them, "Jeremy really belongs in a special school. It isn't fair to him to be with younger children who don't have learning problems. Why, there is a five- year gap between his age and that of the other students!" Mrs. Forrester cried softly into a tissue while her husband spoke. "Miss Miller," he said, "there is no school of that kind nearby. It would be a terrible shock for Jeremy if we had to take him out of this school. We know he really likes it here." Doris sat for a long time after they left, staring at the snow outside the window. Its coldness seemed to seep into her soul. She wanted to sympathize with the Forresters. After all, their only child had a terminal illness. But it wasn't fair to keep him in her class. She had 18 other youngsters to teach and Jeremy was a distraction. Furthermore, he would never learn to read or write. Why waste any more time trying? As she pondered the situation, guilt washed over her. "Oh God," she said aloud, "here I am complaining when my problems are nothing compared with that poor family! Please help me to be more patient with Jeremy." Spring came, and the children talked excitedly about the coming of Easter. Doris told them the story of Jesus, and then to emphasize the idea of new life springing forth, she gave each of the children a large plastic egg. "Now," she said to them "I want you to take this home and bring it back tomorrow with something inside that shows new life. Do you understand?" "Yes, Miss Miller!" the children responded enthusiastically - all except for Jeremy. He just listened intently, his eyes never left her face. He did not even make his usual noises. Had he understood what she had said about Jesus' death and resurrection? Did he understand the assignment? Perhaps she should call his parents and explain the project to them. That evening, Doris' kitchen sink stopped up. She called the landlord and waited an hour for him to come by and unclog it. After that, she still had to shop for groceries, iron a blouse and prepare a vocabulary test for the next day. She completely forgot about phoning Jeremy's parents. The next morning, 19 children came to school, laughing and talking as they placed their eggs in the large wicker basket on Miss Miller's desk. After they completed their Math lesson, it was time to open the eggs. In the first egg, Doris found a flower. "Oh yes, a flower is certainly a sign of new life," she said. "When plants peek through the ground we know that spring is here." A small girl in the first row waved her arms. "That's my egg, Miss Miller," she called out. The next egg contained a plastic butterfly, which looked very real. Doris held it up. "We all know that a caterpillar changes and grows into a beautiful butterfly. Yes that is new life, too" Little Judy smiled proudly and said, "Miss Miller, that one is mine." Next Doris found a rock with moss on it. She explained that the moss, too, showed life. Billy spoke up from the back of the classroom. "My Daddy helped me!" he beamed. Then Doris opened the fourth egg. She gasped. The egg was empty! Surely it must be Jeremy's, she thought, and, of course, he did not understand her instructions. If only she had not forgotten to phone his parents. Because she did not want to embarrass him, she quietly set the egg aside and reached for another. Suddenly Jeremy spoke up. "Miss Miller, aren't you going to talk about my egg?" Flustered, Doris replied, "but Jeremy - your egg is empty!" 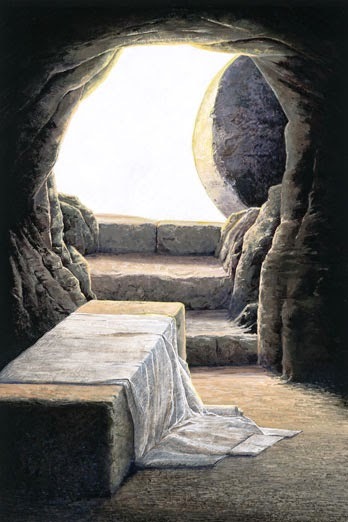 He looked into her eyes and said softly, "Yes, but Jesus' tomb was empty too!" Time stopped. When she could speak again. Doris asked him, " Do you know why the tomb was empty?" "Oh yes!" Jeremy exclaimed. "Jesus was killed and put in there. Then his Father raised him up!" What a great reminder, the tomb is empty. Dear Lord, thank You for dying on the cross for our sins and rising form the dead. Help us not only celebrate that special gift on Easter but throughout the year. In Jesus’ Name, Amen.